MoneyGram offers service directly to mobile wallets around the world. You can send online or in person, in just a few simple steps. Tell us who you are sending money to and how much you wish to send. Provide your receiver's mobile number (with international dial code). Once account deposit is selected, the country specific-mobile wallet option will display. Enter either the amount you wish to send or to be received. You can either pay with your credit1 or debit card, or directly from your bank account. Enter a little information about yourself so we can verify your identity, then review and send. Find a convenient MoneyGram location near you. You will need your receiver's mobile number (with international dial code) in Romania, Kenya, Zimbabwe or Tanzania. Pay in cash, the amount you are sending, plus the fee. Your money is on the way! Funds are usually sent the same day2. Why send to mobile wallets with MoneyGram? 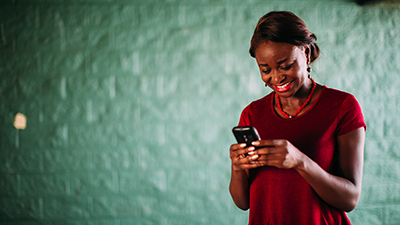 Save your receiver time by sending directly to their M-PESA or Econet accounts. Money is reliably sent into your receiver’s account. 2 Credit will be applied to the receiver’s mobile wallet account specified on the MoneyGram send form. Transfers to mobile wallets are available at selected MoneyGram agent locations. Additional conditions may apply, please refer to the applicable service terms and conditions.